Big investors have slammed the Morrison government’s “big stick” approach to the electricity sector, saying any move to force companies to cut prices will have a major impact on profits, future investment and result in less competition in the long term. 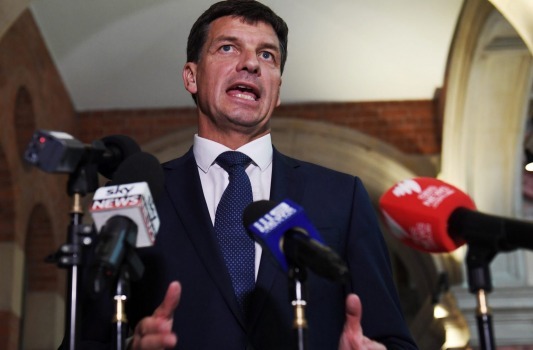 Federal Energy Minister Angus Taylor has called on the big energy companies – AGL Energy, Origin Energy and Energy Australia – to cut their power prices by January, or face the threat of forced divestment as well as other measures such as a default electricity price. A royal commission into electricity prices is also a real possibility. That was Allan Gray Australia‘ managing director Simon Mawhinney, whose company has a stake in Origin Energy. He said the retailers were being targeted in a populist push before the next federal election because the government could do nothing about wholesale prices or regulated poles and wires assets. I checked Alan Gray’s Australian Equity Fund and found that Origin Energy was their third largest investment at 7.4% of the fund, and was listed amongst the five worst investments of the fund in the last month. In these circumstances they are likely to be a net seller of Origin. He said investors had already started to walk from the big energy companies who are now going to be hampered with making long-term investments. “As an investor it’s hard but what about the companies trying to run a business and invest capital on a 10 or 20 year view? As a shareholder I can sell it if I don’t like it. I think it’s a real concern. If you look at Origin and AGL [share] prices they have already been pretty beaten up,” he said. Aims to provide shareholders with reliable, tax-effective dividend income and long-term capital growth. 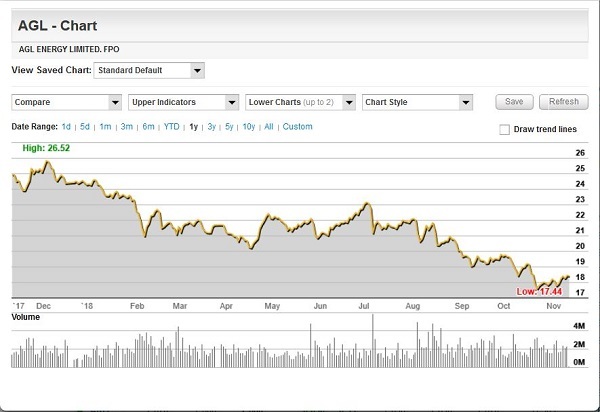 While the ACCC, Taylor et al have been screaming about rip-offs, actually investing in companies like AGL has been an excellent way of losing money. I’ve looked at company research, which shows the AGL profits are likely to be flat over the next three years, and that assumes no tangible and quantifiable ‘big stick’ intervention. I’ve been watching from time to time, so impressions are a little random and selective. However, the NEM seems to be propped up by a backbone of coal in NSW, Queensland and Victoria. Honestly, wind (green) has been a bit hard to find. In recent months there has been a notable increase in large-scale solar, but the swing factor is gas, especially in SA and Qld, which is, of course, expensive. With a hot summer forecast, meaning demand at record levels, it is not surprising that retailers, who control none of the above, would not be keen to offer Taylor what he needs politically, having styled himself as the minister for lower electricity prices. Brian: Did this analysis of power costs in 2013 as part of an article on the effect of rooftop solar on power prices. The post was a commentary on the Qld Competition Authority (QCA) report “Estimating a Fair and Reasonable Solar Feed-in Tariff for Queensland” (March 2013). The retailers were making a moofa for doing???? The report admits that it was only concerned with being fair to the retailers, not rooftop solar PV (RTS) owners, power generation companies or consumers. By implication, the QCA was also comitted to defending the payments made to power distributors. When calculating the “fair” FIT the QCA managed to find excuses for not including most of the savings associated with the use of RTS. This made an enormous difference. If these savings are included, the FIT would have to be above 100 cents/kWh before RTS stopped reducing the power bills of Qld householders who dont have RTS. The QCA exclusions reduced this figure to a measly 8 cents/kWh. There is a case for having a very hard look at the retail system and the profits the retailers are making. However, what is needed is a proper investigation, not loudly waving a big stick. It is also worth noting that changing the generation mix is not going to have a great effect on what householders pay. How best to transfer this analysis and its implications to the public at large? Is Dr Di Natale able to summarise it and speak on it? Down here in horse and buggy land, seems like we’ve had three or four different FIT over the last six years. Panel owners just take what’s offered, unless they can organise a local co-op. Off to check our Coolgardie safe. Possums were at it. Ambi: People seem to be rushing in and installing solar panels no matter what the FIT is. The sums I did in 2013 would be well out of date now. Brian: I agree with you that capping retail prices is unfair given the fluctuation in the price retailers have to pay for the electricity they sell. However, whenever I have looked in the past what strikes me is that the middlemen are making a lot of money for doing???? It is all very well to say that astute consumers can look around and find better deals that are subsidized by those who don’t spend time looking for deals. Part of the problem here is that daily power bills are quite low. For example, Origin figures say that a typical 2 occupant house consumes about 11kWh/day which would const about $2.75. It is simply not enough to justify spending a lot of time comparing the constantly varying retail rates or making decisions re when you should run the washing machine. Some of the price problems would disappear if we replaced the spot market with a system that pays generators for available capacity plus running costs when the generator is actually running. Would be good too if the state governments got back into retailing. At least if they are price gouging the profits will help reduce other state taxes or get things done that aren’t being done properly because of limited finance. When I think about it the LNP proposal re price capping may force retailers out of the market and leave the space for state government owned retailers.